The most imposing building of Sikar, Lakshmangarh fort, (owned by the Jhunjhunwala Family) looms over the well laid out township on its west side. Laxman Singh, the Raja of Sikar, built the fort in the early 19th century after Kan Singh Saledhi besieged the prosperous town. 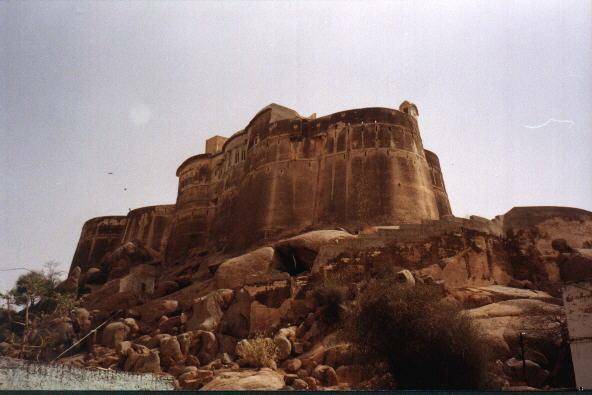 The fort having been constructed on scattered rock, attracts huge attention. The Laxmangarh Fort is owned by a local businessmen and hence closed to the public. One can however climb up the ramp to a temple open to the public, only to view the city from the ramp as further access is denied.